As with any other community on or offline Twitter has its share of malevolent members. Some are merely irritating, some are more distressing and some pose a danger to your reputation. Here are more signs that an account is fake, and some tools to help you test whether your followers are fake. Unfortunately the creation of these accounts is getting smarter, and the bots behind the accounts have got better at mimicking human behaviour, even twitter can’t always spot them. The accounts are most likely spam accounts, if you check the profile and the tweets all links published connect to the same marketing site. It’s possible to buy followers on Twitter, it goes against the terms and conditions of using Twitter, but it’s possible. There’s even a site dedicated to reviewing the various services on offer. The services are sold as social media marketing; which makes no sense if you’re building an audience of bots. The other sales rationale is that it boosts your online credibility. Well, perhaps, temporarily. 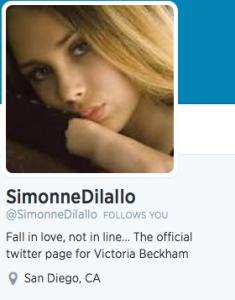 Companies doing this often follow genuine accounts in the hope of follow backs to increase their credibility. An internet troll has been defined as “an abusive or obnoxious user who uses shock value to promote arguments and disharmony in online communities”. You can spot them by their consistently mean and abusive comments, and their failure to back down or apologise when called on it. A failure of evolution? The online world reflects the offline world, there are nasty people offline, you can expect them to also be online. Where anonymity is possible online some trolls use it as a shield to hide behind while they post abuse. Some platforms and some subjects are more famous for attracting abusive comments. 1 Ignore; Trolls thrive on your outrage, if you don’t provide it there’s a chance they’ll go away. 2 Respond; You can respond, challenging the person. It’s unlikely to change their mind or elicit an apology. It’s more like to earn you further abuse and others may join in, escalating it in round after round of competitive abuse. 3 Block; Twitter offers the option to block users, this means you will no longer see their content including tweets those which @ your handle. 4 Report; You can also report users to Twitter if you think their behaviour is abusive or threatening. If you think a threat of violence is credible you should contact your local police. In the UK this has led to arrest and prosecution. The scary thing is you might not know until it’s too late, be alert to any strange activity on your account including multiple password resets. I spotted a hack going on with tweetdeck one day some years ago. 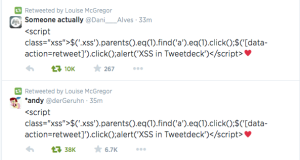 I noticed two very strange tweets, supposedly retweets by me, containing a script which mentioned tweetdeck. I checked whether anyone else had seen this error and there were already a few tweets reporting a problem with tweetdeck, including one linking to a Mashable article. The good thing about sites like Mashable or Techcrunch is they will report real time on attacks and they have the expertise to analyse the problem and tell you what to do. 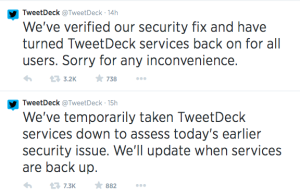 At that point they were saying there’s been a hack on tweetdeck and advising users to logout. I did, reverting to using twitter through the twitter site, where I checked the tweetdeck twitter account. They were already reporting on the issue. The hackers want to steal your money, your identity or destroy your reputation. Alternatively they want to blackmail you. Sometimes they want to cause damage a the company by stealing data, and you have the bad luck to hold an account there. Or they could be looking to blackmail a company. What you can do comes down to prevention and staying alert. Prevention; secure your accounts with strong passwords, use different passwords for each site, and use two factor authentication whenever possible. Here are more tips to protect yourself (although there’s debate on whether changing your password really does help). Stay alert; follow the twitter accounts of the tools you use, if you have doubts check reliable sources such as Mashable, TechCrunch and NakedSecurity. If you are attacked your actions depend on the attack. In the example I gave above from tweetdeck the advice was to log out of everything, when returning Tweetdeck advised a password change. There are the usual scams that promise easy money via work from home schemes, and there are those connected to phishing scams, there are those that spread malware. They’ll often send you a tweet or a direct message with just a link, or they’ll make an outrageous claim in the tweet, “someone is spreading rumours about you” was around a couple of years ago. The people behind them want to steal your money, your identity or destroy your reputation. Don’t click on links in messages or DMs that you’re uncertain about. Don’t fill in any passwords ever unless the URL of the site in the top bar is what you expect, so https://twitter.com/ for twitter. There are more suggestions on protecting yourself here. As for the hackers stay alert, pay attention to credible warnings.